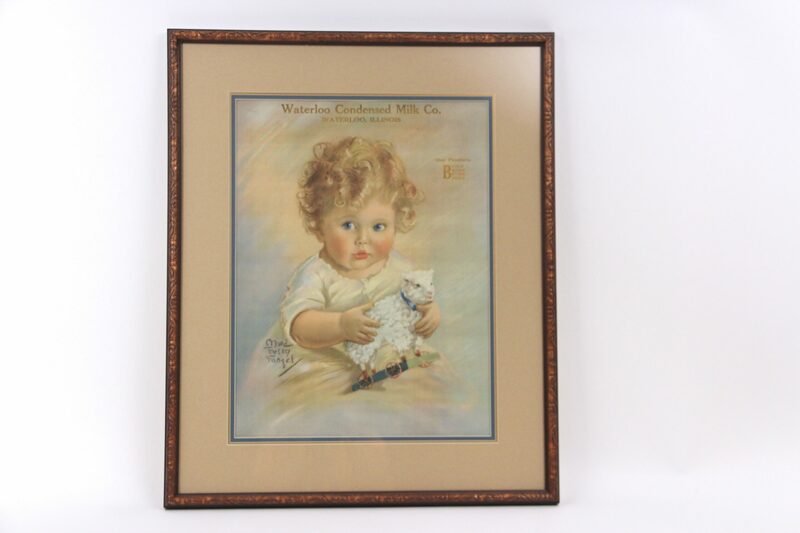 This rare advertising lithograph is from the Waterloo Condensed Milk Company, Waterloo, Illinois, 1922. It is from the estate of a former officer in the company, Mr. A.J. Koenigsmark. The lithograph shows a young girl holding a toy lamb and reads, “Our Products Build Bigger, Better Babies.” The famous children’s artist, Maud Tousey Fangel, drew the illustration. Maud Fangel was nationally known from the 1920’s – 1950’s. 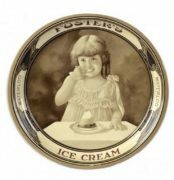 She sketched many advertisements portraying children for companies such as Colgate’s Talc Powder, Cream of Wheat and Squibb’s Cod Liver Oil. Waterloo Milk Company’s advertising slogans were often targeted at young families such as, “Babies Grow With Us”, “Milk Belongs in Every Meal”, “Health in Every Bottle” and “No One Ever Outgrows the Need for Milk”. This colorful pastel lithograph measures 24 inches tall by 16 inches wide. 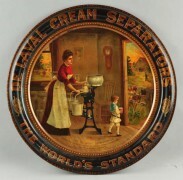 The Waterloo Milk Company created many different advertising pieces for their business. The most popular advertising collectibles are the company’s milk bottles because there were at least 38 different kinds in various shapes, sizes and colors. The milk bottle styles often changed because people returned them to the dairy to be reused and they got broken or cracked with repeated use. 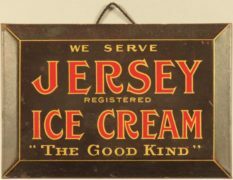 Cardboard milk containers and ice cream containers are considered some of the most rare dairy collectibles. Most of those paper items were thrown away after the product was used making them difficult to find and are valuable to collectors. 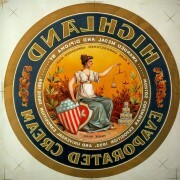 Lithographic signs, tins signs and stock certificates from the company are also difficult to find. Other antique advertising memorabilia include metal dairy crates, milk cans, kitchen utensils, sharpening stones, pens and pencils. The Waterloo Milk Company was a dairy based in Waterloo, Illinois. The dairy started in 1897 and was originally known as the Fountain Farmer’s Creamery Company. 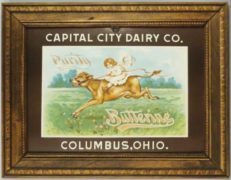 The company changed their name in 1908 to the M & O Milk Company because the dairy was only located a few yards from the Mobile & Ohio Railroad tracks. However, when the company started condensing milk in 1918 the name changed to the Waterloo Condensed Milk Company. Finally, in 1925 the business changed their name to The Waterloo Milk Company, Inc. after it incorporated. The company continued with this name until the business closed in 1969. The dairy manufactured whole white milk, chocolate milk, whipping cream, orange juice, grape juice, ice cream, sherbet, cottage cheese and butter. The company was very prosperous for many years. In 1955 it was one of the largest businesses in Waterloo with sales over one million dollars per year. The company went out of business in 1969 when the competition from larger regional brands started to significantly take their market share. Some of the local family names that were involved with owning a part of the dairy at one time or another include Kolmer, Schmidt, Maurer, Koenigsmark, Pottoff, Nobbe, Stickmann, Hoelscher, Jung, Goeddel, Stoker and Arns. Many of these families’ descendants still reside in the Monroe County area today. When the business closed, the city of Waterloo bought the property and used the buildings to store equipment for over thirty years. All but one of the companies was torn down in 2005 to make room for a new Waterloo government building. When the main building was destroyed some of the workers found a hole that had been sealed shut. The opening contained about 500 of the same style milk bottles. How amazing that these milk bottles were discovered after more than 80 years!